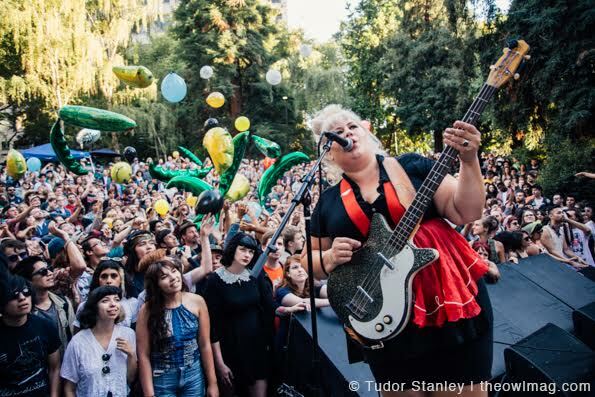 Since Noise Pop Music Festival has always been about the local music scene and amazing venues here in the Bay Area, The Owl Mag asked Shannon of Shannon and The Clams some questions to take their fans (old and new) on a trip back to the beginning and into the now. We talk influences, instruments, music venues, touring, and Noise Pop. The Owl Mag: How old were you when you picked up your first instrument and what was it? Shannon: I started playing bass and singing at the same time when I was 25. I am a late bloomer, and a pretty big believer in putting your mind to things and pulling them off if you’ve got some heart driving you. TOM: Who were your early musical influences? Shannon: Roy Orbison has been my favorite since I was a kid. Also loved Patsy Cline, Gene Pitney, Lou Christie, the Kinks, the Beatles, Etta James, Danzig, the Misfits, Elvis, and OMD. TOM: What was the first album you purchased? Shannon: Frizzle Fry by Primus! TOM: What’s the first concert you attended and where? Shannon: I saw the Bill Graham Presents Memorial Concert when I was 8 at the Golden Gate Polo Fields. I saw The Grateful Dead, Santana, Joan Baez and Crosby, Stills, Nash & Young, Jackson Browne and John Fogerty. TOM: What’s a lasting memory or moment you have from a playing a Bay Area venue? Shannon: The benefit we did for those affected by the Oakland fire at Eli’s Mile High Club. You could feel every person in the room. All the pain and agony and release and bits of joy, celebration of life…everything was so intense and beautiful. I’ll never forget that overwhelming sensation; it was kind of psychedelic or transcendent being able to feel so many people at once. TOM: What are you listening to these days? Shannon: I’m really into early Ennio Morricone right now. TOM: When did you feel you’d made it in the music biz? Shannon: I don’t know that I have. I mean, I guess I have since it’s my job and I work very hard at it. However, I have no money and am constantly struggling to stay afloat doing what I love and what I feel passionate about. I’m really not sure how to answer this. TOM: Any films or other bands you’re excited see during Noise Pop? Shannon: I have no clue who’s playing! Can you send me a schedule? I am very excited to hear Ty’s new songs live and always love White Fence. Shannon and the Clams play at Fox Theater in Oakland on Monday, February 27th to close out Noise Pop 25. You can purchase tickets to the concert here. In case you miss Shannon and the Clams at Noise Pop 25, they will be playing Burger Boogaloo this summer at Mosswood Park in Oakland.